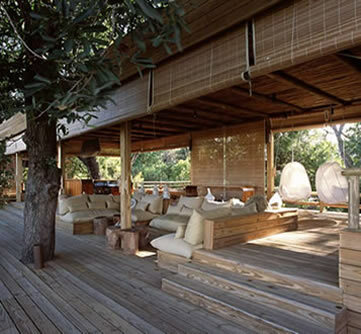 The designers of Vumbura Plains Camp have gone beyond the traditional African vernacular to create a place of simplicity and restraint in which guests are inspired to meditate on the wonders of nature. Vumbura Plains Camp Botswana�s varied, still largely unspoilt habitats and remarkable profusion of wildlife have long held those seeking adventure in their thrall. 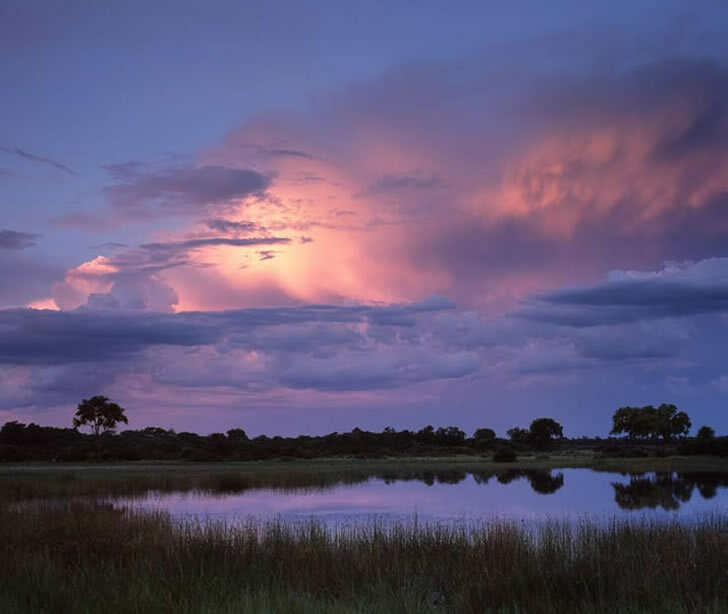 Close brushes with nature are the order of the day at Vumbura Plains Camp, which is set among the wild fig, sausage and jackalberry trees in the extreme north of the Okavango delta. The private and public zones of this clean-lined structure have been constructed as a series of platforms, raised off the ground, and linked by a series of tree-lined boardwalks. Being lost in awe is a routine experience for visitors here, where the views of the vast delta flood plains and scenes of graceful lechwe quietly grazing provide memorable spectacles. North meets South in more ways than one at Vumbura Plains Camp, a concession operated by Wilderness Safaris located in Botswana�s Okavango delta flood plains. Vumbura is sectioned into two separate but lookalike sites: Vumbura Plains North, consisting of six twin-bedded chalets and one honeymoon suite, and Vumbura Plains South, which incorporates four twin-bedded chalets, a honeymoon suite and two family chalets. Each chalet has its own pool, viewing deck and sala (outdoor pavilion) and both camps feature a communal area for dining, indoor and open-air lounging, and game viewing. The sunken outdoor seating area with a fire pit is the place to be as the night settles in. The North/South paradigm is also evident in Vumbura Plains� visual language, a sensitive exploration of contemporary lodge design that blends Scandinavian-style restraint with an exciting new African aesthetic. 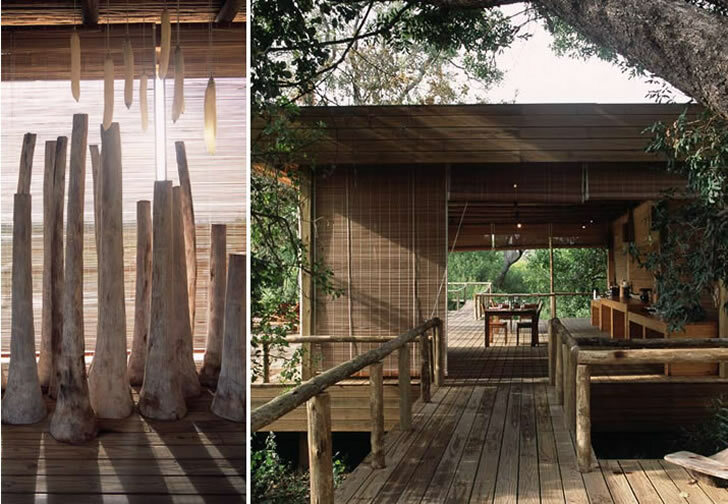 The unobtrusive buildings utilise blonde sandblasted pine � bleached even whiter by the sun � as the primary construction material with virtually no additional materials (other than thatch and latte ceilings, canvas and mosquito-net �walls� and bamboo blinds for protection from the elements) to interrupt the graceful and minimalist overall profile. Other components that resonate with functional eloquence include the modular built-in seating that replaces the usual sofas and armchairs, an emphasis on purity of form, a lack of superfluous detailing and an abundance of natural light. Though Vumbura Plains does not draw on any familiar colonial or traditional African styles, its architecture, colour scheme and decor firmly locate it in its setting by continually referencing nature. The delicate palette of soft greens and blues, taupe and elephanthide browns and greys are subtle reflections of what appears in the landscape. Organic shapes and forms also take all their cues from nature, including the boulder-like central bar counter sculpted from African mahogany, clusters of raw logs used as coffee tables and pebble-inspired ottomans in the suites and library. Almost every item was custom-designed by the creative team � a group headed by pioneering husband-andwife architectural duo Silvio Rech and Lesley Carstens, together with George Boorsma and Lisebo Mokhesi of Ink Design Lab, and with the contribution of interior designers Laurie Owen and Carol English. In order to amplify the indigenous craft/nature connection in a way that remained subtle, the team introduced a selection of commissioned objects: a feature chair handbeaded in a ring design and bearing the watery colours of the delta islands; calabash lights, white fish-leather cushions and fish leather-framed mirrors in the tents; handtufted cotton and leather rugs in the library and bedrooms; hanging egg-shaped chairs in the lounge; a cluster of tall sisal sculptures in the dining room that mimics the profiles of the area�s termite mounds; and, suspended above this, an installation of resin lights moulded from the pods of sausage trees. The rounded contours of the furniture soften the sharp geometry of the building, the rawness of the wood has been countered by the shine of copper and handblown glassware, and tactile fabrics lend an inviting softness to surfaces. 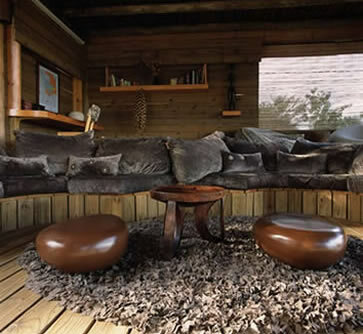 Unimpeded indoor-outdoor contact is the focus of each tented suite. Mosquito-net panelled �walls� and sliding panels of shade cloth replace the customary glass, while kiaat vanities extend through each structure to the outdoor shower area to further blur the boundaries. The resin basins bring to mind the lily pads of the delta. A series of white screens of varying opacity allows one to configure the space for splendid isolation or open-plan airiness. In yet another homage to nature, one of these screens features a laser cutout pattern inspired by the large leaves of the surrounding flora. The same leaf motif is repeated on the white concrete shower tray � a delightful decorative flourish in an otherwise unadorned decor scheme. One of the most strikingly modern aspects of the suites is their seamless, modular quality. Pine flooring extends upwards to compose the bed base, headboard and a desk as well as downward into the recessed lounge area to form both the floorboards and a built-in seating section. �An essential aspect of the design process for us,� explains architect Silvio Rech, �was to distil the essence of what it means to be on safari. As human beings our concept of the safari has evolved from hunting the Big Five to an excitement at the prospect of seeing the Big Five. 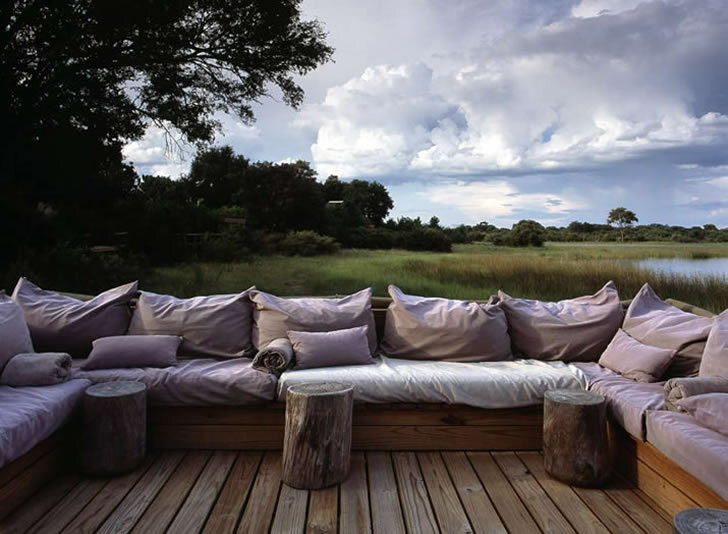 This has ultimately given way to a new sensibility of simply being in and appreciating nature.� With its overriding sense of calm, Vumbura Plains Camp is the perfect location in which to do so.